Thank heaven for halo engagement rings! They are currently among the most sought-after styles. A halo makes the most of a center stone, surrounding it with micro pave diamonds in a shape that either echoes the gem or complements it. 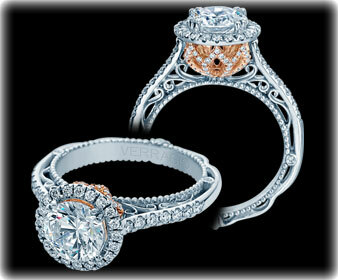 Verragio offers a number of bridal jewelry pieces designed in the halo style. You will see round stones with a round halo, round stones with a cushion halo, oval center stones with an oval halo, cushion stones with a cushion halo, and more! In fact, Verragio has engagement mountings within its Venetian collection that feature a flower halo and an octagonal halo. There are engagement setting with a single halo, and those with a double halo. The Parisian collection offers a mounting where the side stones are enhanced by a halo. The brand’s Classic, Couture and Insignia collections also have halo engagement ring settings, with designer touches that include split shank and twisted diamond bands. Select from white gold or platinum precious metal, two-tone pieces with rose gold profiles, and those embellished with rose gold accents. Whoever said, “A classic never goes out of style,” may very well have been talking about the halo engagement ring. Find yours, here, today!